Infinite Art Tournament: Michael5000 vs The Beatles: "A Hard Day's Night"
After the runaway success of Please Please Me, and our heroes having maintained their momentum with the made-for-a-dime With the Beatles, it was determined that a Beatles movie would probably sell like hotcakes. Oh, what commercialized times we live in! Or at least lived in, during the 1960s! I have seen the movie, A Hard Day's Night, twice. The first time I hated it, and the second time I really liked it. Go figure. 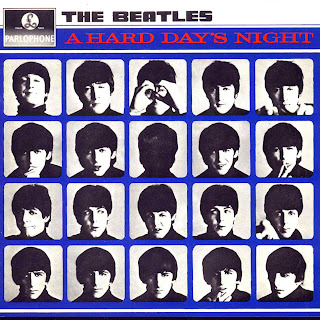 The album A Hard Day's Night is comprised of music written for the film -- although, since the music is in no way related to the action of the movie, this connection is not especially important. The first "side" of the record -- that means the first seven tracks, for you young folks out there -- is the music that was actually used in the movie. The songs on the flip side were not used in the film, which shows good judgment in the editing process. It is obvious that the lads were given a little more time in the studio this time around. The songs, while they still have a spontaneous, as-performed feel to them, are considerably more produced than on the first two albums, the sound is better, and we're starting to get beyond the awkward endings and arguable mistakes that got left in the final recordings of the earlier material. → Please Please Me had a whopping five hyperfamiliar tracks, but With the Beatles had only one. 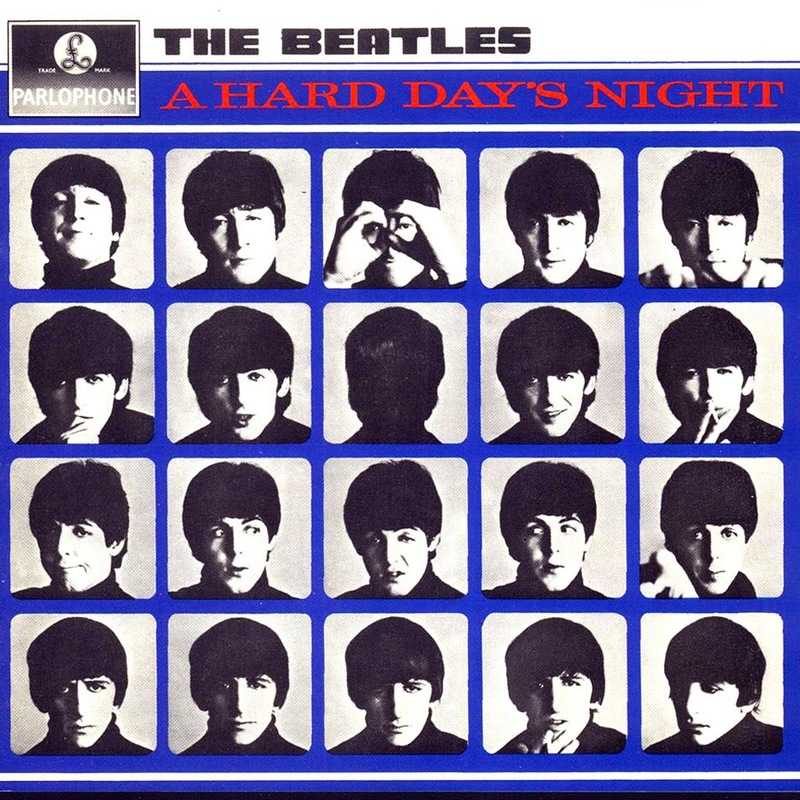 Hard Day's Night has two, the title track and "Can't Buy Me Love." → I've said it before and I will probably say it again: these guys are good singers! That seems kind of square somehow, but there it is. These guys are a good vocal quartet. → The drop-off from Side A to Side B is very noticeable. There is a lot of obvious filler in the back stretch, and I was looking forward to finding out who wrote the cover songs. But! This is the first Beatles album of 100% homegrown material. That shows increasing strength in songwriting, I suppose, but it also means that the Beatles -- the probably mostly mythical "songwriting team of Lennon & McCartney," to be specific -- is responsible for all of the lemons, too. Theme: It is great to get off from work. Well, you know this one. It pretty much gives you everything, zipping along on tight harmonies, energetic drumming, and a understructure of big jangly acoustic guitar. And cowbell! Another pop gem built on a big acoustic guitar strum and tight harmonies (helped along, like most pop vocals from its era up to the present, by electronic echoing). I don't normally associate the Beatles with the harmonica -- it seems a bit more Bob Dylan, don't it? -- but it is used as a very credible solo instrument here. Lyrically, I get hung up on a few lines such as I never realized what a kiss could be/This could only happen to me/Can't you see?/Can't you see? No, I really don't see, but I'm listening to a pop song so I suppose I can deal. In the next lines, That when I tell you that I love you - oh - you're going to say you love me too -- oo -- oo, oh oh, there's a terrific example of how the details of musical magic can make up for even the deepest shortcomings in the words that are being sung. The important words in those lines, as they are sung, are "oh" and "too -- oo --oo, oh oh," just noises really, but vocalized in such a way as to make them sound the very height of cool and sincerity both. Theme: Boy is callously playing the field. It is often surprising how often the early Beatles, who according to myth ushered in the era of rock and roll (whatever that is), turn out to be a combo of old-school vocal crooners. In this hugely pretty ballad, they sound like the high school concert choir, right down to the opening "tag," a tacked-on introduction unrelated to the rest of the song. Now because "If I Fell" is so goddamn gorgeous, and because our lads are champs at delivering their lines, and especially because we are used to hearing stupid crap being dished out in popular song, it is easy to entirely miss the purport of the lyrics. Here they are! All you teen girls out there know to beware of guys with guitars, right? Theme: Boy wishes to dance with girl. Robust but somewhat stiff rocker. When you listen to it carefully, there's a clunky guitar track in the right channel, as if your college roommate had plugged his electric into the stereo and was happily noodling along. If I had the technical know-how, I'd see if the song was better without that track. Theme: And Paul loves her. A quintessential ballad by Paul McCartney, from the beginning of his campaign to fill the world with silly love songs. Simple but effective solo acoustic guitar and percussion stays out of the way of Paul's delivery, or Pauls' delivery -- the double-tracking of his voice (again, a very common practice) is particularly audible in this song. Theme: Boy wants to know why Girl cries, and why she lies to him. A exuberant one-song house party, and my personal favorite track on the album, this two-minute blast of sound is conclusive evidence that Motown records had penetrated 1964 Britain. I went looking to the credits to find out which girl group recorded the original version, and was surprised to find that it is in fact an original Beatles composition. Fun! Theme: Boy doesn't care too much for money, as it can not buy him love. I compare this hyperfamiliar song with "I'm Happy Just to Dance With You." Where that song was cluttered with the ratcheting guitar line, "Can't Buy Me Love" has only a very modest acoustic strum. Mostly it's just Ringo banging away, Paul's subtly astute bass lines, and everything else getting out of the way of the vocals. Theme: Boy indicates emotional availability to Girl. I really dig the chorus of this up-tempo rocker. The verses are fine, but mostly serve to add space in between iterations of the chorus. This happens a lot in popular song; no matter how on-the-money a chorus is, you can't just keep playing it over and over again. It seems indulgent. This is why we have verses and guitar solos. "Any Time at All" has an unmistakeable last-song-of-the-album feel. It would be a great closing track. It's actual position is as the first track of Side B on the original record. As I mentioned up front, music that was actually used in the Hard Day's Night movie was placed on the A-side, and the outtakes were placed on the B-side. So not surprisingly, there is a distinct drop-off in strength of material from this point, and if you were in the market for a shorter version of A Hard Day's Night you might just treat "Any Time at All" as the closer. The album would feel complete, and you wouldn't miss a whole lot. Theme: Boy is frustrated and can't do much about it. This is another one of those entirely competent early Beatles covers of American country and western music. Except, again, it's not a cover this time. There aren't any covers on A Hard Day's Night; at this point, the Beatles are making all their own material. Theme: Something to do with the anticipated duration of a relationship. Motown, country and western, crooner quartets -- you can't say that the Fab Four weren't interested in the musical trends of their times. In "Things We Said Today," they try their hand at folk revival, pulling it off quite nicely and with more than a whiff of psychedelia to come. If I got you a little disoriented, I could convince you that this was a Simon and Garfunkel song, or the Kingston Trio caught in a unbridled moment of rocking out. I like the fluid border between verses and chorus, the little guitar fanfare-flourishes, and whatever it is that Ringo is doing in the choruses. This rocker has all the ingredients of a successful song, but none of the crafting. It is a clunker. When I notice it at all, it is usually to admire the lyric "I've got no time for trivialities," possibly the first introduction of a five-syllable word into the Beatles canon. The effect is immediately cancelled out by the line "I'm gonna love her 'til the cows come home." Theme: Boy forbids Girl to speak to other boys. Standard issue pop-rock song, with -- shall we say -- a blunt first-person affirmation of male prerogative within the teen relationship. Kind of creepy. Theme: Boy will be back. A pretty mid-tempo folk pop number gently ushers us out of the album. It's pretty good. As a set, these last five songs are fine. They are quite literally filler, but they are competent filler. You listen to them, and you note that they are well-made and well-performed, and you might even be tapping your toe or bopping your head a little bit. But, if you are listening carefully over the course of a year, with your mp3 player set to cycle the record indefinitely, you become very, very aware of the moment when "I'll Be Back," the last track, transitions to "A Hard Day's Night," the first track, and the energy level is turned back up to full. Ultimately, the take-home lesson of the Beatles' third record might be that although they are still cranking out a certain volume of filler, it is their own filler and it is able to stand up to repeated listening. And the good stuff is pretty solid. Next on Michael5000 vs. the Beatles: Beatles for Sale. I like that they wrote Can't Buy Me Love and then also covered Money (that's What I Want) - a song with exactly the opposite message.